Was Charles Lindbergh a Nazi sympathizer and anti-Semite? Or was he the target of a vicious personal vendetta by President Roosevelt? Germany: The value of the German Mark decreases to the level that it now costs about 160,000 Marks to exchange for US $1. China: China begins an economic boycott against Japan. Germany: According to official German government reports, 26,789 people are in "protective" custody at various camps. Germany: On Hitler's orders, Ernst Röhm, the head of the SA, is shot in his cell at Stadelheim prison in Munich by Theodor Eicke, the SS Commandant of the local Dachau Concentration Camp as part of the "Night of the Long Knives" or "Blood Purge." Germany: German Pastor, theologian and outspoken public foe of the Nazi regime Martin Niemoeller is arrested. He will become famous as the author of the "First they came for..." poem. 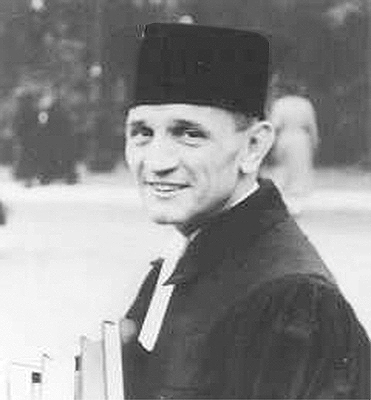 Arrested on 1 July 1937, Niemoller was brought to a "Special Court" on 2 March 1938 to be tried for activities against the State. He was fined 2,000 Reichmarks and received a prison term of seven months. As his detention period exceeded the jail term, he was released by the Court after the trial. 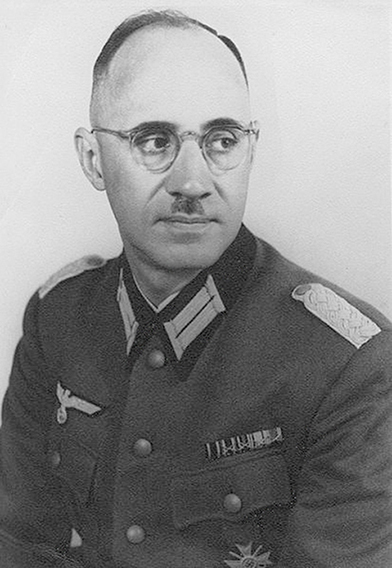 However, immediately after leaving the Court, he was rearrested by Himmler's Gestapo -- presumably because Rudolf Hess found the sentence too lenient and decided to take "merciless action" against him. He was interned in Sachsenhausen and Dachau concentration camps from 1938 to 1945. Spain: Day 350 of 985 of the Spanish Civil War. Spain: Day 715 of 985 of the Spanish Civil War. CBI - China: Day 360 of 2,987 of the 2nd Sino-Japanese War. Day 21 of 139 of the Battle of Wuhan. CBI - China: Day 725 of 2,987 of the 2nd Sino-Japanese War. Day 18 of 68 of the Battle of Tianjin. CBI - Mongolia: Day 52 of 129 of the Battle of Khalkhin Gol, a border dispute between the Soviet Union and Japan. ETO - UK: German troops take the British Crown dependency of Jersey, completing their occupation of the Channel Islands, the only part of the British Isles to be invaded and occupied by German forces during the war. While what happened on the Channel Islands was small-scale when compared to countries on the European mainland, the impact of the Nazi invasion and five-year occupation of the islands was unpleasant, to say the least. Some of the Islanders decided that they had no other choice but to work with the Germans and were branded collaborators. Others chose passive resistance. POWs from the east of Europe were brought as slave laborers to build massive fortifications as part of the Atlantic Wall. Winston Churchill immediately gave the Channel Islands up as lost and determined that they had little strategic importance. In the D-Day invasion and subsequent push to drive German forces out of France, the Channel Islands were completely ignored. Only one public execution took place on the Channel Islands during their occupation. Sixteen Frenchmen left occupied France with the intention of joining the Free French in the UK. They landed in the Channel Islands but believed they were in the Isle of Wight. Giving themselves up to who they believed were the English, they were arrested by the Nazis. The leader was subsequently put on trial and shot by firing squad. The lives for the islanders changed dramatically after a British commando raid code-named Operation BASSAULT in October 1942. Ten commandos landed at Hog's Back, in a raid that was meant to give heart to the islanders and to destabilize the Germans on the island. 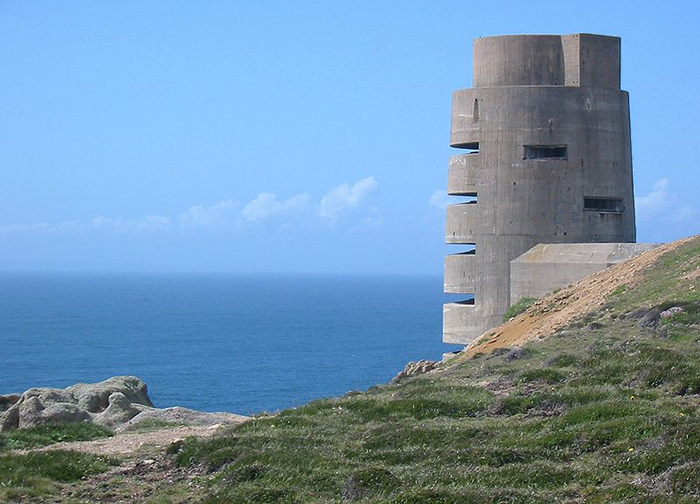 It only served to make the Germans tighten up security on the island and further restricted the lifestyles of those who lived on the Channel Islands. In total six commando raids were carried out on islands that Churchill had specifically stated had no strategic value. Once it became clear that Nazi rule in Western Europe was coming to an end, the people on the Channel Islands turned on those they considered to be collaborators. The people on Sark were all classed as such by those on the larger islands. However, the small size of the island meant that the people there had little choice but to do what they could to get on with the German occupiers who could have made their life a great deal worse if they had not. Women on the islands who had become too friendly with the Germans were also targeted. Known as 'Jerry Bags' or 'Horizontal Collaborators,' life became difficult for them if they remained on the islands once the Germans had left. USA: The Tacoma Narrows Bridge, nicknamed "Galloping Gertie," opens in the state of Washington, connecting the Olympic peninsula to the industrial Washington mainland. It will collapse into the Puget Sound on 07 Nov 40 in one of history's worst engineering disasters. Atlantic: By this date, about 900,000 tons of Allied shipping has been sunk by German U-boats in the first 6 months of war. Atlantic: All in the same convoy 300 miles west of Brest, France, German sub U-30 sinks the British ship BEIGNON, U-102 sinks the British ship CLEARTON and then in turn is sunk by the destroyer HMS VANSITTART, U-65 sinks the Dutch ship AMSTELLAND and U-29 sinks the Greek ship ADAMASTOS. Atlantic: In sea action southwest of Ireland, German sub U-26 damages the British steamer ZARIAN, then British corvette HMS GLADIOLUS forces U-26 to surface with depth charges, which is bombed by the RAAF. The crew of U-26 scuttles their boat and surrenders. ETO - UK: As a prelude to what becomes better known as the Battle of Britain, the Luftwaffe begins a bombing campaign against British industrial centers, beginning with a daylight raid on Hull, England, and Wick, Scotland, killing 12 and wounding 22. ETO - Norway: Germany asks the USA and other neutral nations to withdraw their diplomatic missions to Norway, Belgium, the Netherlands and Luxembourg. ETO - France: Marshal Pétain's government moves from Bordeaux to Vichy. MTO - Romania: King Carol II of Romania renounces the guarantees given to him by the United Kingdom in 1939 and declares that hence-forth his country's allegiance will be with Germany. East Africa: Day 22 of 537 of Italy's East African campaign in the lands south of Egypt. CBI - China: Day 1,091 of 2,987 of the 2nd Sino-Japanese War. Day 230 of 381 of the Battle of South Guangxi. UK: Coal deliveries to all establishments in Britain are limited to one ton per month. ETO - France: The RAF starts conducting daylight bombing raids over Northern France, the English Channel and the Occupied Low Countries in Europe. Germany: Under the provisions of a German Law regarding Prisoner Labor, Russian POWs are sent to work camps for employment in agriculture, construction or heavy industry. The death rate on these camps will be extremely high. Russian Front - Finland: Day 3 of 142 of Operation SILVER FOX, a joint German-Finnish campaign to capture the Russian port of Murmansk in the Arctic. Russian Front - Finland: Day 1 of 140 of Operation ARCTIC FOX, a joint German-Finnish campaign against Soviet Northern Front defenses at Salla, Finland. Russian Front - Finland: Day 10 of 164 of the Battle of Hanko. Soviet sub M-81 is sunk by a German mine in the Baltic Sea. Russian Front: Day 10 of 167 of Germany's Operation BARBAROSSA, the invasion of the USSR. Russian Front - North: Panzer Group 4 crosses the Dvina and captures Riga, Latvia. Russian Front - Center: Day 10 of 12 of the Battle of Minsk. Units of Panzer Group 2 of Army Group Centre reach the Berezina near Borisov in Byelorussia. MTO - Libya: Day 83 of 256 of the Siege of Tobruk. Middle East: Day 24 of 37 of the Battle for Syria and Lebanon. East Africa: Day 387 of 537 of Italy's East African campaign in the lands south of Egypt. CBI - China: Day 1,456 of 2,987 of the 2nd Sino-Japanese War. The European Axis partners recognize the Japanese-backed government of China. British General Wavell becomes Commander-in-Chief in India. The American Volunteer Group, aka The Flying Tigers, is officially formed. 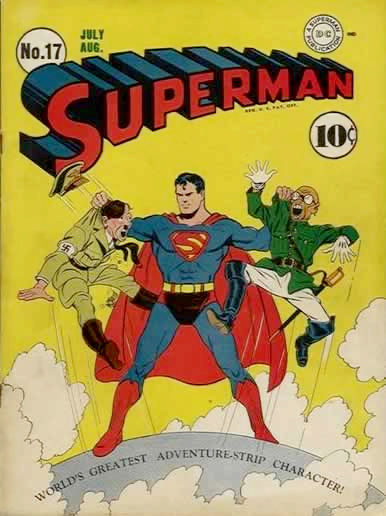 USA: Superman No 17 is released with what will become a classic cover, right in step with America's anti-axis propaganda crusade. Superman had been battling thinly-veiled parodies of evil dictators for months, but great care had been taken to avoid specific references to Germany, Italy or Japan or coming close to mentioning Hitler, Mussolini or Tojo by name. But after Captain America came along in March of 1941, Superman's gloves came off and a flood of Axis-fighting comic book characters soon emerged. Cover art of Superman No 17 by Fred Ray. 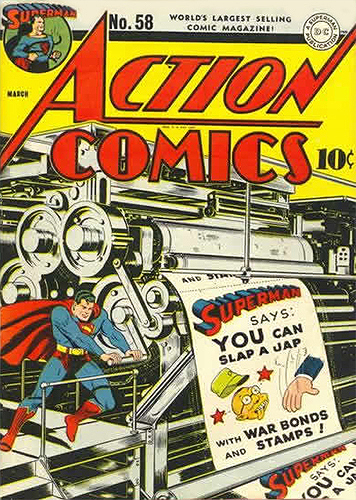 This 1943 cover of Action Comics is a rather extreme example of American war sentiment at its height. Atlantic: Day 169 of 169 of Germany's Second "Happy Time," during which U-boats have sunk 609 Allied ships against a loss of only 22 U-boats. Roughly one quarter of all Allied shipping sunk by U-boats during the entire war occurred in these 169 days. Day 5 of 14 of Germany's Hunt for Allied Convoy PQ-17. During this hunt, U-boats and the Luftwaffe will sink 24 merchant ships. ETO - UK: US 8th Air Force: The first B-17 Flying Fortress, assigned to the 97th Bomb Group of the BOLERO air movement via the north Atlantic route, lands at Prestwick, Scotland. Russian Front - North: Day 297 of 872 of the Siege of Leningrad. Russian Front - North: Day 58 of 658 of the Siege of the Kholm Pocket. Russian Front - Central: Jews are massacred in the Byelorussian cities of Minsk, Lida and Slonim. Russian Front - South: Day 245 of 248 of the Siege of Sevastopol, Crimean Peninsula. German troops keep pressing a heavy assault. Russian Front - South: Day 4 of 27 of the Battle of Voronezh, Russia. Russian Front - South: Day 4 of 150 of Germany's CASE BLUE, the failed offensive to take the Caucasus oil fields. MTO - Egypt: Day 1 of 27 of the 1st Battle of El Alamein. German troops begin their advance, capturing some 2,000 Allied prisoners while losing 18 of their 55 Panzer tanks. MTO - Libya: US HALPRO B-24s night bomb the harbor at Tobruk. East Africa: Day 58 of 186 of the Battle of Madagascar. CBI - China: Day 1,821 of 2,987 of the 2nd Sino-Japanese War. Day 48 of 124 of Japan's Zhejiang-Jiangxi Campaign, launched to punish anyone suspected of aiding the Doolittle raiders in China. Roughly 250,000 Chinese will be killed. Chiang Kai-Shek formally submits his "Three Demands" to Joseph Stilwell to forward on to Washington DC. His request includes 5,000 tons of supplies, 500 war planes and 3 US divisions for the Chinese theater of war. President Roosevelt superficially agrees to the demands, but indefinitely stalls the delivery of such. US 10th Air Force bombs the docks at Hankow. PTO - Alaska: Day 25 of 435 of the Battle of Kiska, Aleutian Islands. PTO - Malaya: Day 133 of 357 of the Battle of Timor Island. USA: The Women's Army Auxiliary Corps (WAAC), established 15 May 42 to work with the US Army, is redesignated the Women's Army Corps (WAC), a branch of the US Army. Russian Front - North: Day 662 of 872 of the Siege of Leningrad. Russian Front - North: Day 423 of 658 of the Siege of the Kholm Pocket. MTO - Italy: US 9th Air Force RAF Halifaxes hit railway yards at Catania, Sicily. MTO - Italy: US 12th Air Force RAF Wellingtons night bomb barracks and the railway station at Cagliari in Sicily. CBI - China: Day 2,186 of 2,987 of the 2nd Sino-Japanese War. PTO: Day 36 of 47 adrift in a raft for the survivors of B-24 GREEN HORNET that crashed 850 miles from Hawaii. PTO - Alaska: Day 390 of 435 of the Battle of Kiska, Aleutian Islands. PTO - New Guinea: Day 71 of 148 of the 2nd Battle of Lae-Salamaua. US 5th and 13th Air Forces provide air support. PTO - Russia: The USS S-35 sinks the Japanese fishing tender BANSHU MARU No 7 off the Kamchatka Peninsula, Russia. PTO - Solomon Islands: Day 12 of 67 of the Battle of New Georgia. US 5th and 13th Air Forces provide air support. US Marines overrun the Japanese at Tombe near the Viru Harbor while others occupy Tetemara on the west side of the harbor. Other Marine units arrive at Rendova just south of New Georgia. On Vangunu Island, the US Army are forced to fall back to Vura. Lithuania: Soviet forces advance to the outskirts of Vilnius and German troops prepare to retreat. Before the assembled Jewish inmates in the concentration camp there, Major Karl Plagge, who had been discretely trying to care for and save them, gives an informal, coded speech warning them that in two days the SS will be coming in to kill them, thus allowing many of them to survive by hiding. Wehrmacht officer, engineer and Nazi Party member Major Karl Plagge used his position as a staff officer to employ and protect some 1,240 Jews - 500 men, the others women and children, in order to give them a better chance to survive the nearly total annihilation of Lithuania's Jews that took place between 1941-1944. On being drafted into the Heer at the beginning of World War II, he was put in command of an engineering unit, HKP562, whose duties involved repairing military vehicles damaged on the eastern front. Plagge and his unit arrived in Vilnius (Vilna) in July 1941 and soon witnessed the genocide being carried out against the Jews of the area. Plagge would later testify that "I saw unbelievable things that I could not support... it was then that I began to work against the Nazis." Plagge felt responsible for some of the horrors he witnessed and felt compelled to work against the genocidal machine. He supported his workers' survival by procuring extra food rations and supplying hot meals to the workers in his workshops (an unusual measure) to supplement their starvation rations. He also allowed his Jewish male workers to barter for food with his men as well as local gentiles within the workshops so that they could smuggle food back to their families in the ghetto (an illegal activity). Plagge also aided the survival of the Jews under his jurisdiction by providing warm clothing, medical supplies and firewood - all scarce commodities. On several occasions he and his subordinate officers helped secure the freedom of some of his workers or their family members when they were arrested during SS sweeps of the ghetto. In 2005 the Yad Vashem Holocaust Memorial posthumously bestowed the title "Righteous Among the Nations" on Plagge, who passed away in 1957. Like Oskar Schindler, Plagge blamed himself for not having done enough. UK: The Bretton Woods conference begins to discuss financial and economic concerns in post-war Europe. The International Monetary Fund for Reconstruction and Development will be established as a result. ETO - UK: Day 19 of 86 of the V-1 "Buzz Bomb" offensive on Britain. ETO - France: Day 26 of 49 of Operation OVERLORD, the Allied invasion of Normandy, France, known forever simply as D-Day. D-Day+25: Allied Air Forces provide air support. ETO - France: Day 26 of 62 of the Battle of Caen. Russian Front: Russian fighter ace Grigori Rechkalov receives his second Hero of the Soviet Union award. He becomes the Soviet's third highest ace with 57 credited kills. Russian Front - Finland: Day 7 of 15 of the Battle of Tali-Ihantala. This becomes the largest battle in Scandinavian history. Russian Front - Finland: Day 11 of 50 of the Battle of Karelia. Soviet troops continue their offensive against the Finns in eastern Karelia between Lake Ladoga and Lake Onega in northern Russia. Russian Front - North: Day 151 of 191 of the Battle of the Narva Isthmus, Estonia. Both German and Soviet troops remain locked in their defensive positions. MTO - Italy: Day 16 of 34 of the Battle of Ancona (north of Rome). Allied Air Forces provide air support. CBI - Burma: Day 119 of 166 of the UK's Operation THURSDAY. CBI - Burma: Day 114 of 147 of the Battle of Myitkyina. US 10th Air Force provides air support. CBI - Burma: Day 92 of 302 of the Chinese Salween Offensive. US 14th Air Force provides air support. CBI - China: Day 2,552 of 2,987 of the 2nd Sino-Japanese War. Day 76 of 259 of Japan's Operation ICHI-GO. Day 10 of 48 of the Battle of Hengyang. US 14th Air Force provides air support. CBI - India: Day 116 of 118 of the Battle of Imphal-Kohima. The retreating Japanese troops are encircled at Ukrul. PTO - Alaska: US 11th Air Force B-24s bomb targets on the southern part of Shimushu Island and Kurabu Cape Airfield on Paramushiru Island. PTO - Caroline Islands: US 7th Air Force bombs targets on Ponape Island. At night they bomb targets in the Truk Atoll. PTO - Japan: The USS TANG sinks the Japanese freighter TAIUN MARU No 2 in the morning and tanker TAKATORI MARU after sundown. PTO - Mariana Islands: Day 17 of 25 of the Battle of Saipan. US 7th Air Force provides air support. PTO - New Guinea: Day 36 of 83 of the Battle of Biak. There are still 3,000 Japanese soldiers on the island who won't give up. PTO - New Guinea: Day 200 of 597 of the Battle of New Britain. US 13th Air Force provides air support. PTO - New Guinea: Day 71 of 481 of the Battle of Western New Guinea. 5th Air Force provides air support. PTO - New Guinea: Day 18 of 80 of the Battle of Lone Tree Hill. PTO - Solomon Islands: Day 244 of 295 of the Battle of the Bougainville Islands. US 13th Air Force provides air support. Germany: US, British and French troops move into Berlin in accordance with the four-power agreement over the division of Germany into zones. CBI - China: Day 2,917 of 2,987 of the 2nd Sino-Japanese War. PTO - Borneo: Day 22 of 67 of the Battle of North Borneo. US 5th and 13th Air Forces provide air support. PTO - Dutch East Indies: Day 1 of 21 of the 2nd Battle of Balikpapan. The Australian 7th Division lands on the southeast coast of Borneo after a 15-day bombardment, capturing the oil production center. PTO - Japan: The US sub USS BARB attacks Japanese positions on Kaihyo Island off Sakhalin with rockets. This is the first rocket attack made by a US submarine. PTO - Japan: US 20th Air Force B-29s drop incendiary bombs on the Japanese urban areas of Kure, Kumamato, Ube and Shimonoseki. PTO - New Guinea: Day 552 of 597 of the Battle of New Britain. US 10th Air Force provides air support. PTO - New Guinea: Day 436 of 481 of the Battle of Western New Guinea. US 10th Air Force provides air support. PTO - Philippines: Day 254 of 299 of the 2nd Battle of the Philippines, aka the Liberation of the Philippines or the Philippines Campaign. PTO - Philippines: Day 199 of 244 of the Battle of Luzon. The battle is said to over but hold-outs will continue fighting for a couple of more months. Local citizen Pedro Cerono discovers 8 skulls that lead to the discovery of the Tapel Massacre by Japanese troops. PTO - Philippines: Day 114 of 159 of the Battle of Mindanao Island. The battle is said to over but hold-outs will continue fighting for a couple of more months. PTO - Philippines: Day 106 of 135 of the Battle of the Visayas region. The battle is said to over but hold-outs will continue fighting for a couple of more months. 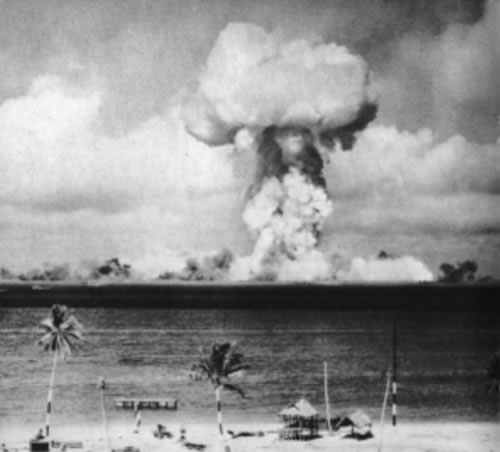 Micronesia: The United States conducts test ABLE in the Bikini Atoll as part of Operation CROSSROADS, which sees an atomic detonation in the air. News of this test inspires a new term in the fashion industry for two-piece swimwear for women, the bikini, which will debut under that name on July 5th. The "Able" explosion, part of Operation CROSSROADS, a nuclear weapon test by the United States military at Bikini Atoll, Micronesia, on 01 July 1946. East Germany:The Berlin air lift begins. The prominent Protestant pastor and outspoken Hitler foe who spent the last 7 years of Nazi rule in concentration camps is best remembered for his "First they came for..." poem.